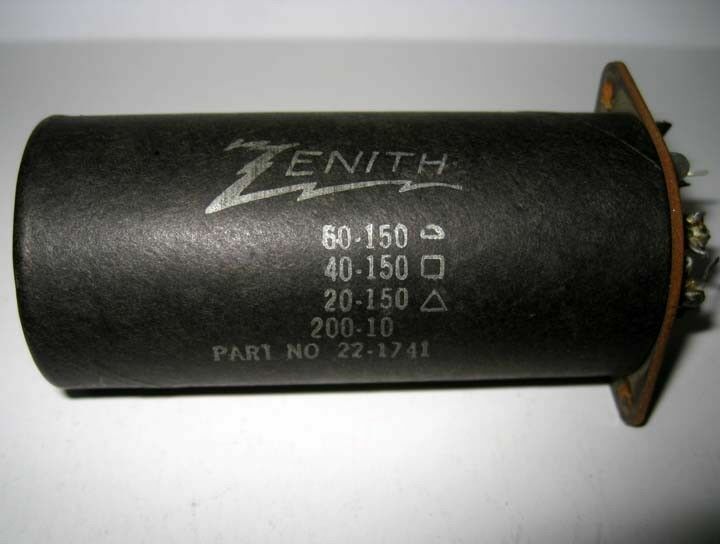 I have a Zenith TransOceanic radio, a G500. The capacitor issue is the one with three in one capacitor in the round tin can. The cartouche's are not on the bottom of the capacitor. On replacing the three capacitors I need a little help in identifying what wires goes where. Can someone post a photo of the bottom of the can and the orientation of the wires. Use the schematic to ID where all the connections go. Common practice is to disconnect the original capacitor, but leave it in place for appearance. Then install a terminal strip and install 4 discrete capacitors. It is common to use 160-volt parts, but many of us recommend that the rating be 250 volts----the difference is cost is negligible. For C1D, I'd use a 25-volt part. All I need is a single photo of a G500 where the new wiring fits the lugs, with the diagram, the cartouche is not visible on mine. The H500 has different placement. I have four different schematics, that are really good, however I just want to make sure it's 100% correct. What is "cartouche" in this context?? Are you replacing the whole capacitor can with a similar one----or are you installing 4 separate parts? To indicate which capacitor is at which lug. This is from a H500 and may not be the same for the G500. I generally restuff the cans and this is what I do. Disregard the colors I have there. I draw the circle and put in the tabs. Then follow the wire from the output of R21. One wire will go to the double resister pack (Can't remember the proper name). Another will go to the can. That will be the 60uf cap in the can. Now follow the center wire on that resister pack and that will be the 20uf cap. Now you only have 2 left and you should be able figure out which is which by just following the schematic back to the can. If you fill in all the connections to the can, you can now remove one section at a time and connect to the proper capacitor. Checking and rechecking your work is VERY important. A wire in the wrong place can be devastating. I have blown every filament in the radio because of a wiring mistake. I highly recommend replacing the 1L6 with a 1R5 until your ready to do an alignment. Which chassis do you have? If I may say so, I do think that there are some indicator shapes on the outside of the tabs, rather than the inside where you would ordinarily look for them. I have the entire PDF here which I can send to you if you will PM me your email address. The G500 is different than the H600. The drawing uploaded of the H500 is exactly what I'm looking for in the G500. If anyone has a hand drawing of it that would be great. If not I'll have to work on it double checking it. Ive double checked the wiring, the H500 is a different setup. Besides the capacitor the H500 placement of parts, resistors, capacitors is different. Only a few things are simular. Replaced with four capacitors, I was able to figure out the sequence. Replacing everything, capacitors, resistors, power cord, this makes more room for installing the four capacitors. At least I am 90% sure of it being wired correctly, thats why I asked for help. I have several schematics, the cartouche is missing, so I'm studying the schematics. This is going to be my "daily" radio, I found a G500 that was trashed, the case was broken, modified. After I repaired the case restored the original shape, using one of my radios as a template, I recovered the radio skin. So it's no big loss on the antique part. Becides, I have two G500, and two H500 radio that are my "museum pieces" they are exactly factory made no modifications, all original. One was a Korean war radio from a family member who traveled with it everywhere. It looks really good, he took real good care of it. I don't normally post on the forums, I usually don't get the answer I'm looking for, and from my experience I don't play well with others. Last edited by walz on Jan Fri 11, 2019 11:25 pm, edited 1 time in total. I don't normally post on the forums, I usually don't get the answer I'm looking foe, and from my experience I don't play well with others. It's just me I'm naturally abby-normal. Post subject: Re: Capacitor question HELP! I'm still not 100% sure of the capacitor colors. Anyone have anything??????? I don't know what you mean by "capacitor colors". I have a 5g40 chassis. A 60-150 TO number 3 above. B 40-150 TO number 2 above. C 20-150 TO number 1 above. D 200-10 TO number 4 above.